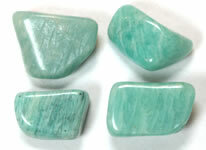 Amazonite is a green microcline feldspar. It is named after the Amazon River of South America, where the first commercial deposits were found. 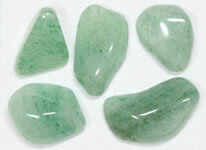 The stones shown here are a light green Amazonite that was mined in Mozambique. Shop for Amazonite. 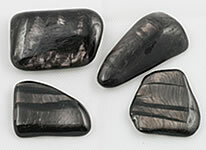 Apache Tears are round nodules of obsidian that polish to a beautiful jet black color. If you hold them up to the light you will see that they are a translucent to transparent glass. 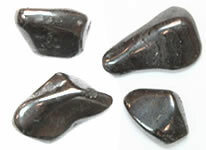 These polished Apache Tears were produced from a material found in Arizona (USA). Shop for Apache Tears. 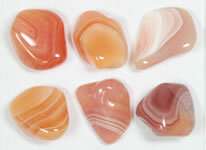 Apricot Agate is a banded agate that is named for its apricot pink or orange color. It is a beautiful material with bands of whites, creams, yellows, oranges and pinks. 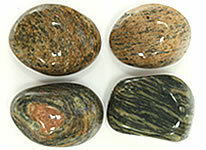 The stones shown here were produced from agate mined in Botswana (Africa). 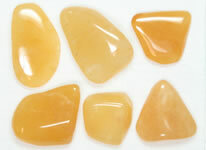 Shop for Apricot Agate. 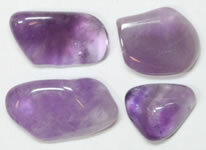 Amethyst is the name given to transparent to translucent purple quartz. It often forms in alternating bands with white to clear quartz. 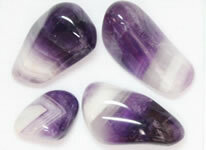 The resulting material is called Banded Amethyst or sometimes Chevron Amethyst. The Banded Amethyst used to produce these stones was mined in Namibia (Africa). Shop for Banded Amethyst. 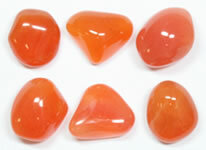 Carnelian is a translucent orange to red or brown agate. It often forms in alternating bands with white chalcedony. The result is known as Banded Carnelian. 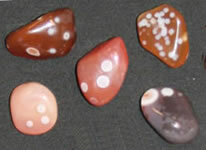 These stones were produced from an orange to pink material mined in Botswana (Africa). 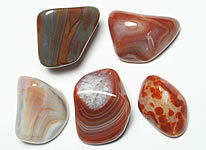 Shop for Banded Carnelian. 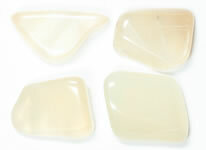 Moonstone occurs in a wide variety of colors, including black and dark gray. The black to gray bodycolor is visible from most directions, but when the angle of light or angle of observation is just right, a flash of silver adularescence is produced. The luster approaches metallic. Tourmaline has one of the widest color ranges of any gem. The colors are caused by the mineral's many compositions. The most common tourmaline color is a material that is so black that it is essentially opaque. This pitch-black variety is known as "schorl." 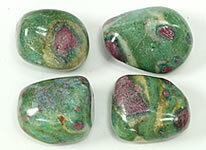 Bloodstone, also known as heliotrope, is a green jasper splashed with small drops of red. 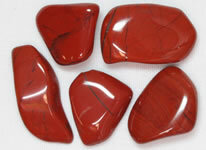 The red drops remind many people of blood and that is the source of the name Bloodstone. It has been a popular stone since Biblical times. 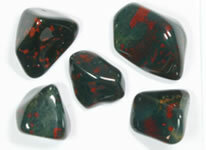 The Bloodstone shown here was produced from material mined in India. 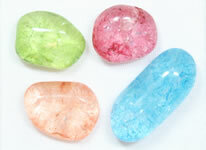 Beryl is mineral that occurs in a variety of colors. When it is attractive it is used as a gem. Transparent blue beryl is the very popular gemstone known as "aquamarine". When it is translucent to opaque the name "blue beryl" is most appropriate but some mall jewelry stores use the name aquamarine. Shop for Blue Beryl. There are very few blue gemstones. Occasionally the variety of microcrystalline quartz known as chalcedony occurs in a blue color, such as this blue material mined in Namibia (Africa). Blue Lace Agate is the name given to a chalcedony that consists of alternating bands of white agate and subtle blue to transparent agate. The result is a lacy appearance that looks like blue lace. 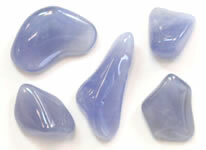 The Blue Lace Agate shown here was produced from material found in Namibia (Africa). 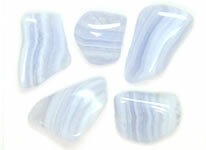 Shop for Blue Lace Agate. Blue quartzite is a metamorphosed sandstone that receives its color from tiny blue inclusions of a fibrous mineral that is probably dumortierite. The abundance of the inclusions causes color variation within the stone and some intense blue bands where the inclusions are most abundant. Shop for Blue Quartzite. 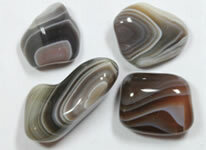 Botswana Agate is a name given to a banded agate found in Botswana (Africa). 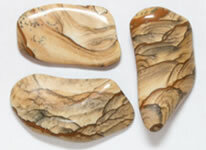 This agate typically has wonderful white, gray and brown banding - sometimes with "eyes" - and takes a very high polish. Shop for Botswana Agate. 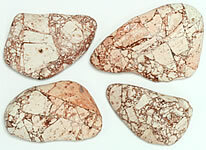 "Breccia" is a rock composed of angular fragments. 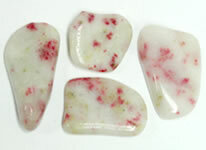 Brecciated jasper consists of jasper fragments cemented together with agate or jasper. 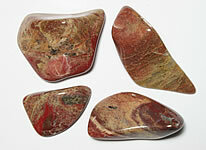 The Brecciated Jasper shown here is a bright red material with white, gray and black markings. These stones were produced from material found in South Africa. Shop for Brecciated Jasper. 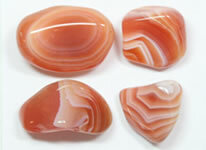 Carnelian Agate is a translucent orange to red or brown agate. It has been a popular gemstone since Biblical times. The stones shown here have a bright orange color and a very bright polish. They were produced from agate found in Botswana (Africa). Shop for Carnelian. 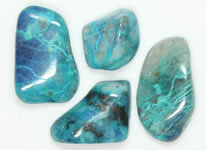 Chrysocolla is a vivid blue to blue-green mineral that contains copper. It often forms in intimate association with quartz or chalcedony to yield a durable gemstone. 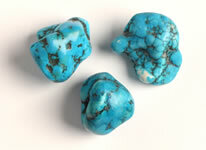 Chrysocolla is often found associated with copper deposits much like the mineral turquoise. These stones were produced from material mined in Namibia (Africa). Shop for Chrysocolla. Cinnabrite is a rock composed of scapolite (white) and epidote (red). 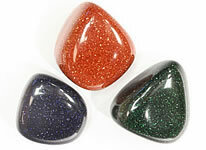 Its eye-catching appearance makes it an interesting gem material for making cabochons, tumbled stones and other items. Its name makes some people think that it is composed of cinnabar and quartz, but that is incorrect. Citrine is a variety of transparent to translucent quartz that ranges in color from a light yellow through orange to amber brown. Yellow and golden citrine is especially popular. These stones were produced from material found in Brazil. Most citrine quartz is produced by heat-treating Amethyst. 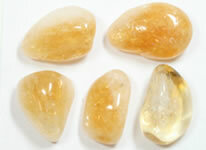 Shop for Citrine Quartz. 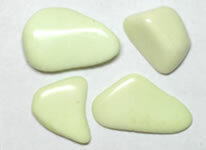 Citron Magnesite is a pale green to bright green magnesium carbonate with a color similar to ripening citrus fruit. That's the source of the name "citron". 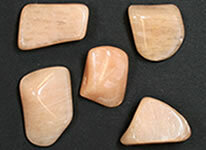 These stones have a soft luster polish and were produced from material found in Australia. Shop for Citron Magnesite. Quartz is one of the most abundant minerals in Earth's crust but clear specimens with very little color and nearly free from inclusions are seldom found. 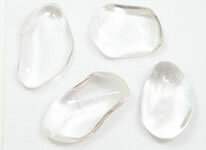 They are known as "clear quartz" or "rock crystal". They capture the light and have a "bright" appearance. Shop for Clear Quartz. 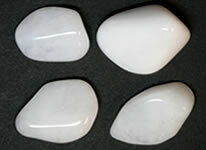 Moonstone is the name used for stones of orthoclase feldspar with a soft pearly luster, sometimes with adularescence. It occurs in a variety of colors which include: white, cream, pink, brown and gray. These colored moonstones were produced from material found in India. 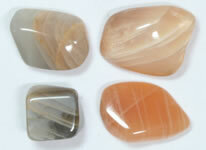 Shop for Colored Moonstone. Confusionite is a material that, at least to the observer, is difficult or impossible to identify. No person who possesses an abundant number of polished stones should be ashamed to confess that he can not identify a significant number. These stones can be called "confusionite" to reduce embarrassment. A rare find is fossil coral that has been replaced by agate - or agatized. This type of fossilization often preserves the structure of the coral individual or colony. The result can be a beautiful stone that can be polished to display cross and lateral sections through the coral fossil. "Crackle Quartz" is a name used for quartz specimens that have been heat treated and then dyed to change their color. The heat treatment produces fractures in the stone that facilitate the penetration of dyes. Crackle Quartz is sometimes found in our Souvenir Mix. 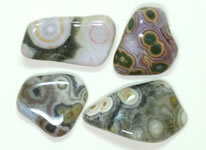 Crazy Lace Agate is a white to gray botryoidal agate with colorful stains that are usually yellow, orange, red and brown. Most of the material offered for sale originates in Mexico. 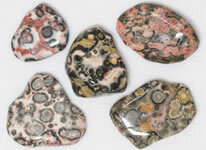 It exhibits a lace-like pattern of curves and eyes and is a popular material for tumbled stones, cabochons and beads. 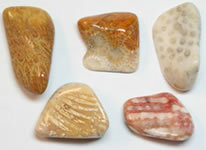 Shop for Crazy Lace Agate. 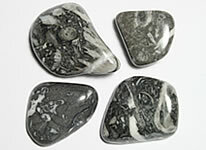 Dalmatian Stone is white to gray igneous rock with black spots. It is given that name because white specimens have a color pattern similar to a Dalmatian dog. 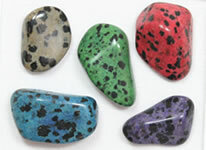 Dalmatian Stone is often dyed a variety of colors. Dyed Dalmatian Stone is usually found in our Souvenir Mix. Dolomite is a sedimentary rock that is very similar to limestone. Most people would never think of it as a gemstone. However, it can be brightly polished by people who know how, and, it often contains interesting fossils of brachiopods, crinoids, bryozoans and other ancient organisms. Dumortierite is a bright blue, dark blue or greenish-blue mineral that is occasionally found in metamorphic rocks. It can be polished to a high luster and is one of just a few blue minerals that are hard enough to be used as a gemstone. The stones shown here were produced from material mined in Mozambique (Africa). Shop for Dumortierite. 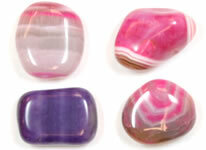 Agate is a variety of chalcedony that can be extremely colorful. It is slightly porous, with some bands and zones being more porous than others. When heat treated and exposed to dye, the porous zones absorb more dye than the less porous, producing a stone that is banded with various color intensities. 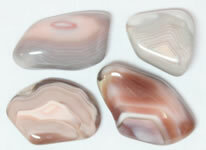 "Eye agates" are rare agatesthat have perfectly circular markings or "eyes". These are actually three-dimensional features that extend into the stone in the shape of a hemisphere. Sometimes eye agatehas concentric or "bull's eye" color zones. Lake Superior and Botswana agates frequently display eyes. 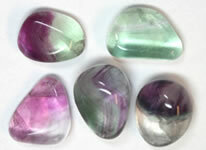 Fluorite occurs in a variety of colors such as purple, green, yellow, blue and clear - that are often banded. It often has a wonderful fluorescence. Although it is beautiful it is not well suited for jewelry use because it has a hardness of four and has perfect cleavage in four directions.. Shop for Fluorite. Gneiss is a metamorphic rock in the shale - slate - phyllite - schist - gneiss sequence. It usually contains an abundance of feldspar minerals and quartz. 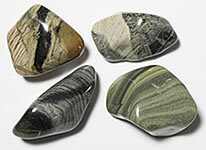 Many specimens of gneiss can be brightly polished in a rock tumbler if they do not contain very much mica. Goldstone is a man-made glass that contains abundant crystals with a bright metallic luster. Flat faces of the crystals catch and reflect light to give the stone a glittering appearance. The glittering is triggered by moving the stone, moving the light, or changing the angle of observation. Shop for Goldstone. Granite is an igneous rock composed of quartz and feldspar with minor amounts of micas, amphiboles and other minerals. It can be pink, white or gray in color. Although the minerals in granite have various hardnesses, it can easily be tumbled into attractive stones. Here are a few granitesthat we tumbled. 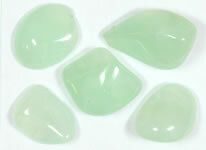 Aventurine is a translucent quartz with inclusions of platy minerals such as muscovite mica, hematite or goethite. The inclusions reflect light entering the stone to produce a glistening known as "aventurescence." These stones were produced from material from Zimbabwe (Africa). Shop for Green Aventurine. 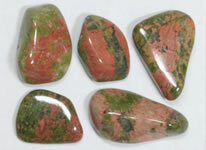 The most common jasper color is red and after that in abundance is green jasper. It is often a very very dark green - so dark that at first glance you think that it is black. 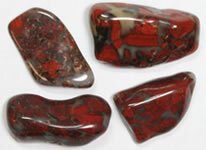 When green jasper is marked with red splotches, the rock is then known as "bloodstone". 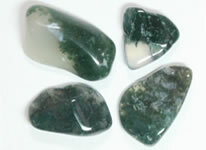 Moss agate is a translucent to transparent chalcedony that contains visible inclusions with a mossy or dendritic shape. 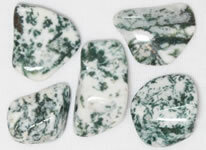 The moss agate shown here has dark green inclusions. These stones were produced from material found in India. 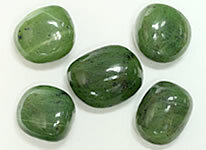 Shop for Green Moss Agate. The grossularite garnet used to make tumbled stones, beads and carvings is an opaque, massive garnet that often has an attractive green color. It is found in South Africa where it has been incorrectly called "Transvaal Jade" (it has no mineralogical relationship with jade). Shop for Grossularite Garnet. Hematite is an iron oxide mineral with a bright red or silver color. It is has a specific gravity that is about double that of the typical gemstone - thus it feels very heavy. 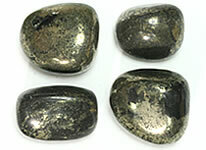 This hematite has a bright silver metallic luster. 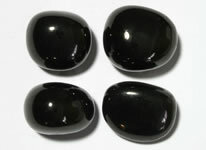 These hematite used to produce these stones was found in Brazil. Shop for Hematite. Hypersthene is a black silicate mineral occasionally found in igneous rocks such as gabbro, basalt and andesite. It accepts a bright polish which sometimes reveals zones and bands of a phenomena that seems transitional between chatoyance and play-of-color. Shop for Hypersthene. Jet is an organic rock similar to coal, but instead of breaking like coal it can be cut, carved or polished into interesting sculptures, beads or faceted stones. Jet is a very light-weight material and was popular in jewelry of the Victorian Era. It is rarely seen as a tumbled stone. Shop for Jet. 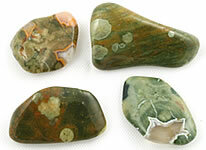 Kambamba Jasper is a dark green orbicular jasper that takes a nice polish and is found in Madagascar. 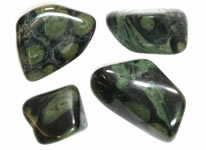 The Kambamba jasper shown here is a dark green material with green to black circular markings (orbs). Kambamba is also known as "crocodile stone" because the markings on it remind some people of crocodile skin. 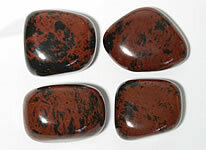 Shop for Kambamba Jasper. Labradorite is a variety of plagioclase feldspar that often exhibits bright flashes of electric yellow, green or blue when played in the light. This phenomenon is unique to the mineral and has been named "labradorescence". It is one of our favorite tumbled stones. 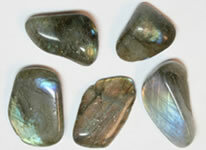 Shop for Labradorite. Lake Superior Agates are banded chalcedony nodules that formed in the gas vesicles of ancient Canadian lava flows. Glaciers then scoured them from their host rock and carried them south into the Great Lakes region of the United States. 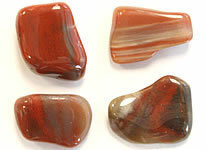 They are beautiful red, brown and often crystal-centered agates. Shop for Lake Superior Agate Rough. 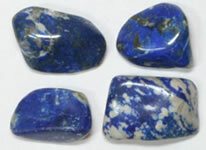 Lapis Lazuli is a gemstone that has been popular since Biblical times. 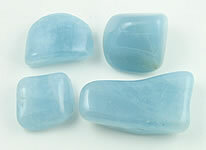 It is one of just a few blue gemstones. It often contains white calcite veins and sparkles of gold pyrite. 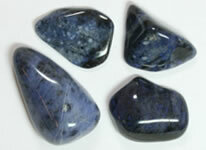 The stones shown here have a bright blue color and were produced from material mined in Chile. Shop for Lapis Lazuli. Leopard Skin looks like its name. It is a cream to tan to pink rhyolite with black, white, red, or tan markings in a color pattern that resembles the fur of a leopard. It is a popular gemstone that polishes well. These stones were produced from material mined in Mexico. Shop for Leopard Skin. 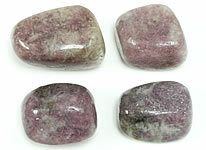 Lepidolite is a variety of mica that occurs in a spectrum of colors that range from pink to deep lavender. The stones shown here are tumbled quartz pebbles that have enough lepidolite inclusions to yield pink and lavender gemstones. Amethyst is a purple variety of crystalline quartz that can be transparent through translucent. When it has a soft purple color it is often called "lilac amethyst". The stones shown here were produced from material mined in South Africa. Shop for Lilac Amethyst. Lionskin is a rock that contains fragments of golden tiger's eye and other material cemented in a clear quartz or milky agate matrix. It might be considered a "tiger's eye breccia" because the tiger's eye fragments are angular in shape. 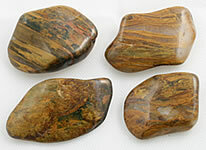 Many of the breccia fragments display the chatoyance that gives tiger's eye its name. Shop for Lionskin. Lodestone has amazed people for thousands of years because it is a natural magnet. When suspended on a string, it will orient itself with Earth's magnetic field. It has a silver metallic luster and is a variety of the iron ore magnetite. These specimens were found in the United States. Magnesite is a magnesium carbonate mineral. It usually has a white or gray color and is sometimes marked with gray to black veins. It is porous and its white color allows it to accept dye with very predictable color results. It is often confused with Howlite. Shop for Manesite. Magnesite is one of the most commonly dyed lapidary materials. It is often dyed to produce bright colors that are not often found in natural stones. It is also used as a substitute for turquoise. These are sometimes sold without disclosure. Mahogany Obsidian is a rare variety of obsidian (a natural volcanic glass) that gets its name from its brown color. 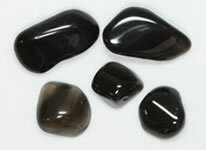 It ranges from a "black obsidian with brown markings" to a solid brown material. It accepts a very bright polish and is very popular because of that polish. Shop for Mahogany Obsidian. Malachite is a green copper carbonate mineral. It often displays swirled and banded patterns in shades of light through dark green. It is a very heavy material because of its high copper content. 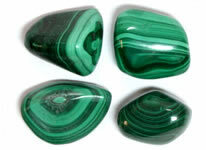 These stones were produced from malachite mined in Zaire (Africa). 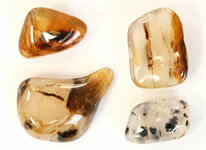 Montana Moss is a transparent to translucent agate with brown and black mossy inclusions. The base color ranges from clear through milky to amber brown. It is named after the State of Montana where it is found at many locations and is a popular rough with lapidaries. Mookaite is silicified radiolarian siltstone that is found in Western Australia. Many specimens of Mookaite can accept a very high polish. It is widely known for its spectacular contrasting color patterns of yellows, creams, reds and maroons. Shop for Mookaite. Nephrite and jadeite are the two minerals that can rightfully be called "jade." 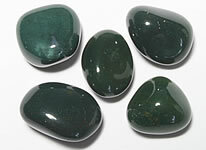 Nephrite is the less valuable of the pair. It occurs in colors that range through white, cream, green, gray and black. It can be difficult to polish in a rock tumbler because it is so tough. Ocean Jasper, sometimes called "orbicular jasper," is a silicified rhyolite or tuff that contains "eyes" formed from radial quartz and feldspar crystals. It occurs in a variety of colors, but green, yellow, white, pink and cream color patterns are very common. It often has an amazing fluorescence. Shop for Ocean Jasper. Most people think of a sticky, gooey rock when they hear the name "oil shale". However, it is often silicified enough that it can be polished in a rock tumbler to produce beautiful banded tumbled stones with subtle shades of gray, brown, tan and green. Olive opal is a color variety of common opal with a greenish yellow or yellowish green to black color. It can be translucent to opaque and translucent pieces often have a resinous appearance that reminds you of a greenish amber. Shop for Olive Opal. Quartz naturally occurs in almost every color of the spectrum. These colors are caused by impurities in the quartz crystal. 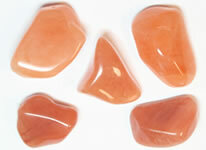 This gemmy orange quartz in a beautiful "peach" color was produced from a mine in India. Shop for Orange Quartz. Orthoclase is a very common mineral of the feldspar family. It often has a pleasing peach color and soft pearly luster. Surprisingly orthoclase has not received the same level of lapidary attention as amazonite - another feldspar mineral with an interesting color. It has right angle cleavage and often breaks into interesting shapes. Petrified wood forms when plant debris is buried and then replaced by mineral material such as chalcedony or opal. This often occurs when a forest is buried under a volcanic ash fall. When polished these pieces of wood often display interesting grain patterns that can sometimes be linked to a specific type of plant. Shop for Petrified Wood rough. Petrified wood is found at many localities worldwide. The most famous are in the state of Arizona (USA). Much of the petrified wood found there is various shades of red without distinctive wood grain. It is sometimes found as logs or tree segments. Most is found as small pieces scattered on the surface or in dry washes. Shop for Arizona Petrified Wood. Pyrite is one of Earth's most common minerals. It is found almost everywhere and in almost every type of rock. Its metallic yellow color causes it to be often mistaken for the much more valuable gold. That's how it earned the name "fool's gold." Some people call this material "healer's gold" - but it has no medicinal value. "Picasso stone" reminds many people of the interesting art style of the famous painter, Pablo Picasso. It is a beautiful material with angular patterns in gray, brown, black, cream, white and other colors. These stones were produced from material found in Utah (USA). Shop for Picasso Stone. 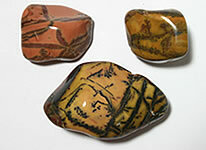 Picture Jasper is a material marked with colors and patterns that look like "landscape" scenes - thus the name "picture jasper." If you study a stone you will often find interesting "pictures" of landscapes and deserts. These stones were produced from material found in Namibia (Africa). Shop for Picture Jasper. 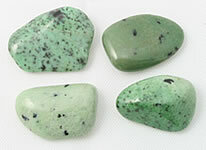 Aventurine is a quartz with abundant inclusions of platy minerals such as mica. The inclusions reflect and scatter light within the stone to produce a glittering phenomenon known as "aventurescence." The pink stones shown here were produced from material mined in Canada. Shop for Pink Aventurine. 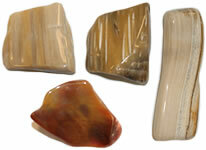 "Botswana agate" is the name given to banded agates produced in the country of Botswana (Africa). 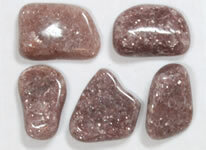 Some of these stones occur in a gray through creamy pink color. These are known as "Pink Botswana." Shop for Pink Botswana Agate. 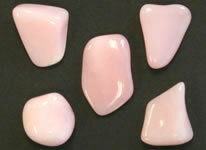 Pink opal is a variety of common opal that is rarely seen as a tumbled stone. It can be a beautiful material even though it lacks the "play of color" exhibited by precious opal. These specimens were mined in Peru, a country that is well known for producing pink opal. Polychrome Jasper gets its name from its many colors - "poly" + "chrome". It is often red, brown, orange, gray, white, and bluish or greenish colors. These colors are usually arranged in banded or swirled patterns. The most famous deposit is in Madagascar, but look-alike material is found in many areas. Prehnite is a yellow to green silicate mineral that is occasionally found in igneous and metamorphic rocks. 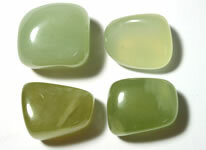 The specimens used as gemstones generally are transparent to translucent with a pleasing yellow-green color. The stones shown here were produced from material mined in South Africa. Shop for Prehnite. Rainforest Rhyolite is a mottled greenish to brown, heavily-patterned material that is thought to have formed from the silicification of rhyolite. It can contain numerous orbs, poppy-shaped structures and occasional vugs that are sometimes filled with a milky to bluish chalcedony. Some people call it "Rainforest Jasper". Shop for Rainforest Rhyolite. Rainbow "Hematite" is a man-made material that is often given a thin coating of an iridescent metallic material. The bright iridescent colors really attract attention and produce sales in gift, souvenir, and science stores. 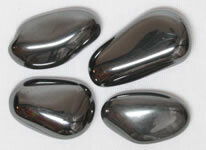 The name "hematite" is in quotes because it is a misnomer. 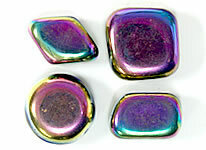 Shop for Rainbow "Hematite". 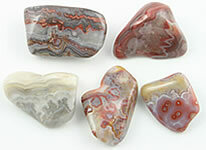 Jasper is an opaque chalcedony and red is one of its most common colors. This red jasper from South Africa has a fire-engine red color that in some stones is interrupted by a white to transparent quartz vein. It often accepts an exceptionally high polish. Shop for Red Jasper. 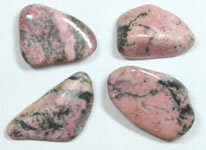 Rhodonite is a metamorphic manganese mineral that is well known for its beautiful pink color. It is often found as nodules that are cut by abundant black veins of other manganese minerals. The material used to produce these stones was mined in Canada. Shop for Rhodonite. 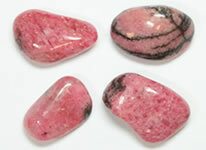 Raspberry rhodonite is a bright pink variety of the manganese mineral, rhodonite. It is a metamorphic mineral with a gemmy pink color that is often interrupted by veins of black manganese oxide. The specimens shown here were found in Madagascar. 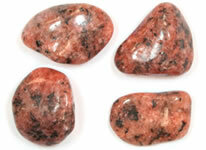 Shop for Raspberry Rhodonite. Rhyolite is an extrusive igneous rock that is produced during gas-charged explosive eruptions. When rhyolite has been silicified, it can be polished in a rock tumbler. The material shown here is known as "chipboard" because its broken appearance reminds some people of the inexpensive substitute for plywood. 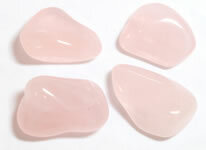 Rose quartz is a transparent to translucent variety of crystalline quartz with a soft pink color. It takes a very high polish and is an exceptionally popular semiprecious stone. The material used to produce these stones was mined in Namibia (Africa). Shop for Rose Quartz. Fuchsite is a green mineral of the mica family, and ruby is a well-known gem material. When together they are called Ruby in Fuchsite. 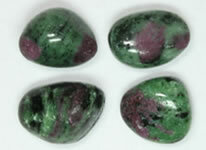 It is often confused with Ruby in Zoisite. They are easy to tell apart because R-i-F usually contains some blue kyanite near the "rubies." Zoisite is a mineral that is rarely found in metamorphic rocks. Even more rarely it contains bright red corundum crystals (rubies). This bright green zoisite mined in Tanzania (Africa) contains occasional red rubies a few millimeters in diameter. 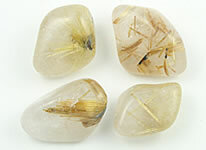 Rutilated quartz is clear to smoky quartz that contains needle-like inclusions of rutile. The number of rutile needles can range from a few thin isolated needles to a dense network of intersecting fibers. The needles are often golden in color and align with the crystallographic axes of the quartz. Shop for Rutilated Quartz. Serpentine is the name used for a large group of minerals that are often cut and polished into beautiful gemstones, ornamental stones and architectural materials. It is sometimes used for fine carvings. It can be difficult to tumble to a bright polish but a few people have mastered that work. Shop for Serpentine. 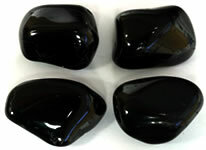 Obsidian is a natural volcanic glass that can be polished to a very high luster. Some stones of obsidian contain white crystals of the mineral cristobalite. 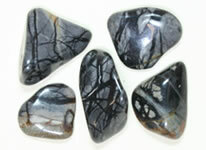 When polished these stones produce a gemstone known as snowflake obsidian. 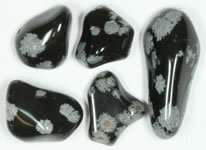 Shop for Snowflake Obsidian. 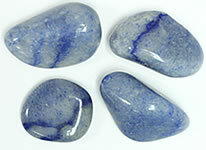 Blue rocks and minerals are rare and that is what makes sodalite an interesting mineral. It is an igneous mineral named for its sodium content. It typically occurs in a range of blue hues but white and pink colors are also common. 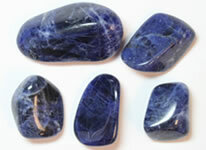 Shop for Sodalite. Sunstone is a plagioclase feldspar that contains abundant inclusions of platy minerals such as mica or metals that sparkle in reflected light. This sparkling luster is known as aventurescence. These specimens of sunstone were mined in India. 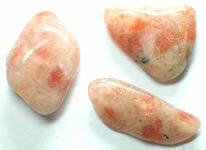 Shop for Sunstone. Tiger's-Eye receives its name from how reflected light forms a band that crosses the stone at a right angle to linear structures within the stone. Although the most popular Tiger's-Eye is golden to brown in color, it also occurs in other colors such as this deep blue material found in South Africa. 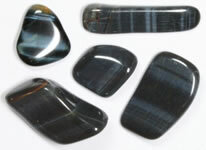 Shop for Blue Tiger's-Eye. Tiger's-Eye receives its name from reflections of light that form a band crossing the stone at a right angle to fibrous structures within the stone. 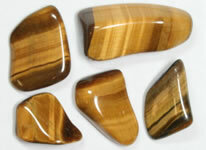 The Tiger's-Eye shown here is the popular and typical golden brown color. These stones were produced from material found in South Africa. Shop for Gold Tiger's-Eye. Most Tiger's-Eye is a honey to golden brown color; however, it is sometimes heat-treated to produce a deep reddish color. 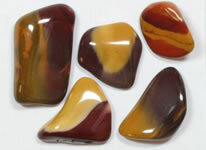 A small amount of red tiger's-eye is produced by natural heating. These stones were produced from material found in South Africa. 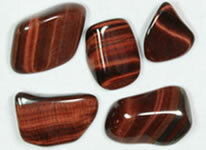 Shop for Red Tiger's-Eye. 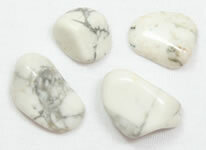 Tree agate is a name used for a white chalcedony that has green dendritic markings. 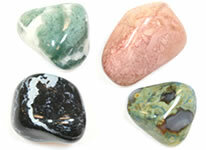 It is a very popular material used to make beads, cabochons and tumbled gemstones. The stones shown here were produced from material mined in Botswana. Shop for Tree Agate. Turquoise is a gemstone that is so famous for its distinctive blue-green color that the name of the gemstone has entered common language. 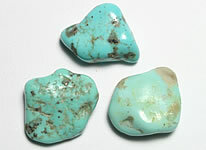 Turquoise has been mined in many parts of the world. It is most famous use is in the Native American art produced by the people of the southwestern United States. Turritella is a rockhound name used for a brown, translucent, fossiliferous agate found in the Green River Formation of Wyoming. The name was given because the christener thought the fossils were of the Turritella genus (they are really Elimia tenera), but the name has stuck. 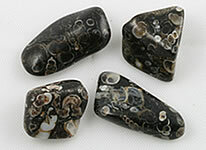 Shop for Turritella Agate. Unakite is an igneous rock that contains mostly green epidote and pink orthoclase, but with minor amounts of quartz and other minerals. It is often polished to produce an interesting gemstone. The stones shown here were produced from material mined in South Africa. Shop for Unakite. Moonstone is the name used for stones of orthoclase feldspar with a soft pearly luster, sometimes with adularescence or fluorescence. These white to cream-color stones have a nice pearly luster and bright polish. They were produced from moonstone mined in India. Shop for White Moonstone. White quartz is one of Earth's small number of ubiquitous minerals - that means it is found almost everywhere. Perhaps it is rarely polished because it is so common that it is overlooked. 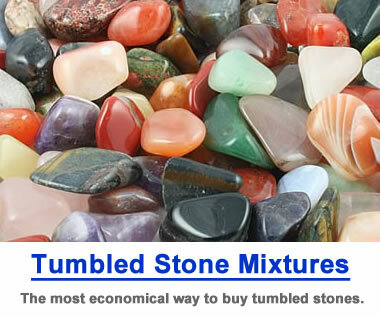 However, it is a beautiful tumbled stone that works nicely in jewelry and craft projects. Shop for White Quartz. Yellow feather is a multi-color jasper found in Utah. The name "yellow feather" was inspired by dark feather-like markings that cut across a basecolor of yellow, brown or reddish orange. IIt is used to make interesting tumbled stones.Shop for Yellow Feather tumbling rough. 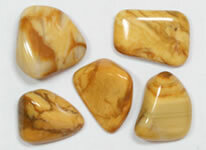 Yellow Jasper is an opaque yellow to yellow-brown-beige chalcedony that can be polished to a very high luster. 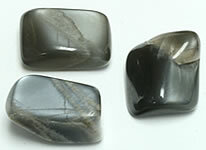 These stones, produced from material mined in South Africa, show some dark brown to cream color zones that produce a scenic pattern. Shop for Yellow Jasper. 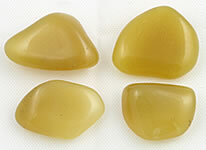 Yellow Quartz is a translucent to transparent quartz with a light to deep yellow color. These translucent stones were produced from material mined in India and have a very bright polish. Shop for Yellow Quartz. 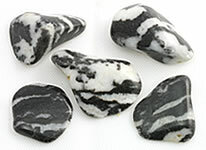 Zebra Marble is a black and white material that has a coloration similar to a zebra. It is a dolomitic marble in which the banded appearance is actually foliation caused by the heat and pressure of metamorphism. Shop for Zebra Marble. Gemstones of the World (fifth edition) by Walter Schumann is one of the most popular gemstone books ever written. Over one million copies have been sold. 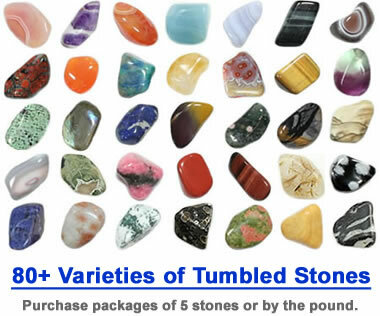 It has about 100 pages of basic gemstone information and about 200 pages dedicated to photos and descriptions of over 100 gems and gem materials. It contains about 1900 photos of gemstones in rough and cut states. It is an easy-to-understand book written for people high school age and up. Get your copy of Gemstones of the World.